In the following interview Jörg Steiner, project manager in Research & Development, offers insights into his career path leading him from the Montanuniversität Leoben to voestalpine Giesserei Linz GmbH. I worked at the steel plant a few times during my vacation, after my school leaving examinations and before starting university. Right from the beginning I was totally fascinated with the steelmaking-process, and in the end this influenced my choice of study. While still studying I often spent the summers at the LD steel plant, the foundry, and in refractory construction. Then at the end of my studies I wrote my Master’s thesis on behalf of voestalpine Giesserei in Linz. And after successfully graduating, it was here that I was able to start my professional career, first in process molding, then as a process manager, and since December 2016, as project manager for material development in the R&D department. A current focus lies in the development and optimization of alloying concepts for high-temperature-resistant and creep-resistant chromium steels and nickel-based alloys. Here we primarily work within international, cross-divisional working groups, and naturally try to meet customer demands and requirements as best we can. "I was provided with the first tools for my current job at the Montanuniversität: the ability to organize myself, a fascination for steel and metallic materials, and a solid grounding in the subject matter. " It is important to retain an interest and delight in the subject area itself after finishing university. That means always being open to new ideas and having a positive attitude to change. 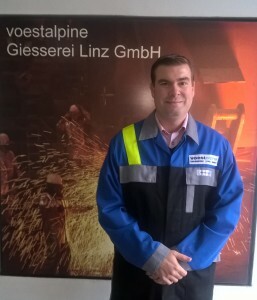 What do you particularly appreciate about your employer voestalpine Giesserei Linz GmbH? On the one hand, it’s the cooperative working environment in which everyone helps each other and offers support in a whole range of fields. "And on the other, it's the excitement of the work itself and the opportunities to develop and grow which voestalpine offers."